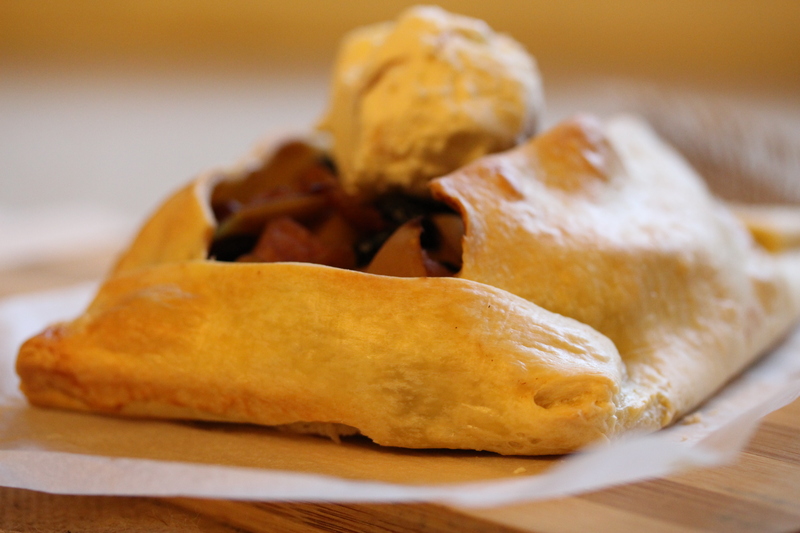 This apple pie is a delectable, warm and quick twist on a classic dessert. The aroma from the spices will appeal to your senses and permeate your kitchen with a gorgeous woody earthy smell. Using store bought shortcrust pastry makes this a super quick recipe. Placing some frangipane mixture beneath the apples, prevents the pastry from becoming soggy. I think peeling apples is optional, keeping the skin on adds some flavour, texture and loads of nutrients as loads of vitamins are in the apple skins. Pre- heat oven to 180C quarter steam and heat/25% steam*. Cut apples in half, core, cut each piece into thirds. Add sugar, lemon juice, ginger, cinnamon and 2Tb water (optional add blueberries), stir to combine. Place onto a medium heat, and cook for 10minutes, stirring regularly. Make sure that the liquid does not run out and apples stick to the bottom or burn, if required add 1 extra tablespoon of water at a time. Cut corner from the pastry, creating a curve shape. 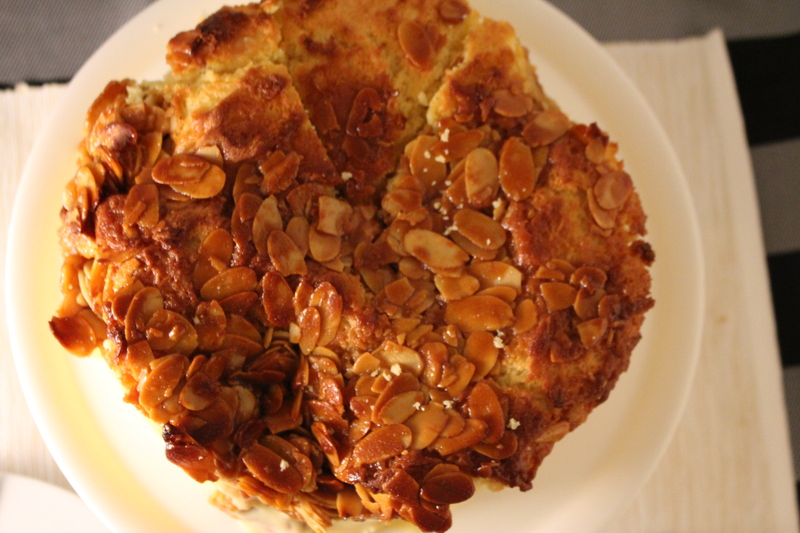 Mix together all ingredients for frangipane mixture. Divide frangipane mixture into 2. Line a baking tray with paper, depending on the size of your tray you may need to use 2. In the centre of the piece of pastry, place half of the frangipane mixture and spread out, leaving a 4 cm edge around the pastry. Repeat with the second piece of pastry. 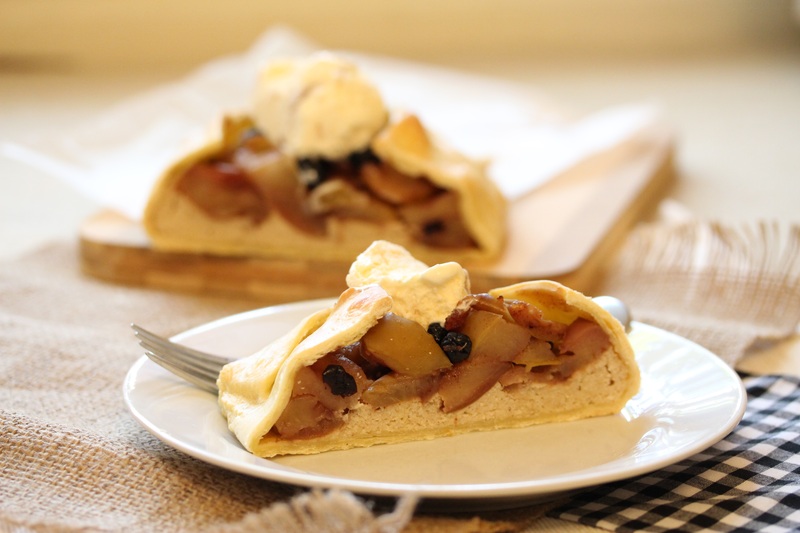 Place apples on top of frangipane mixture, fold pastry into a parcel, pressing the corners in firmly. Brush with egg white mixture. Bake for 15minutes on quarter steam and heat. 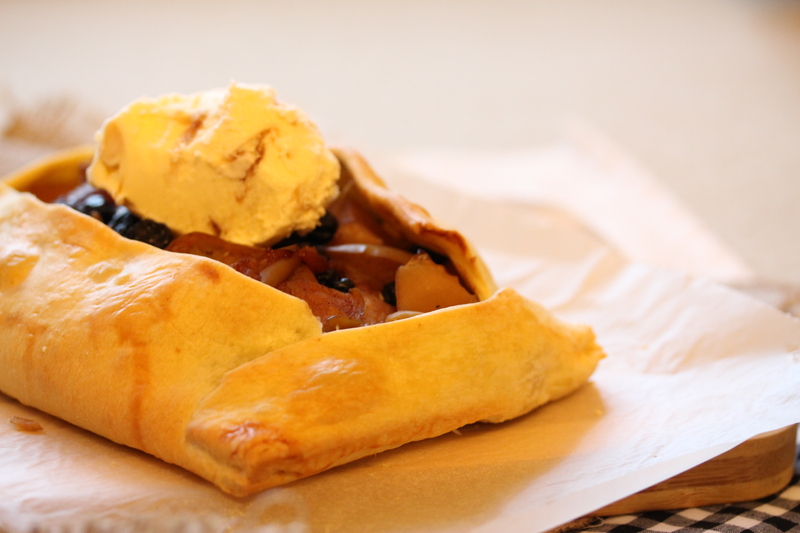 Serve wedges of pie with a dollop of ice cream, cream or custard. *if you do not have a combination steam oven, you can use a fan forced oven at 180C. The difference you may see in the final product is that using a combination steam oven, will be the lightness and fluffiness in the pastry. 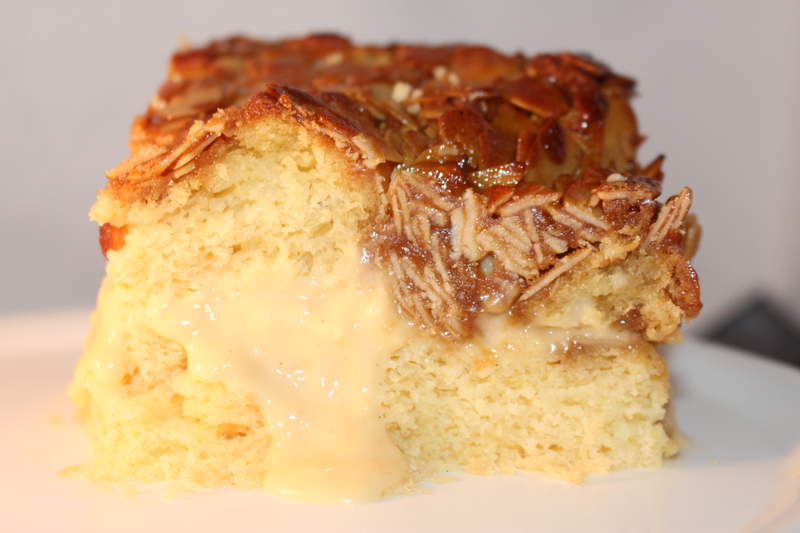 As the temperature begins to drop, there is a need for some scrumptious warm winter desserts. 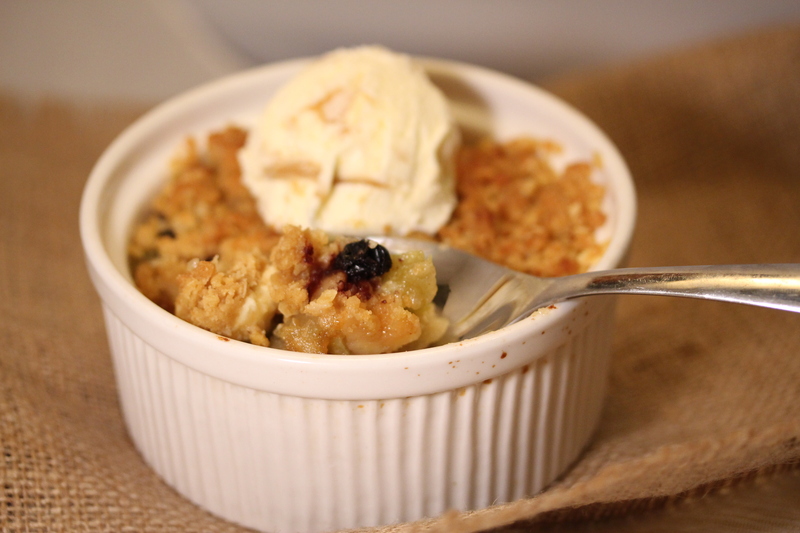 This crumble is amazing. I have separated the crumble mixture from the apple mixture, as you could easily add this delicious crumble to the top of other fruits such as apricots, pears or prunes. If you could imagine a very ‘adult’ version of a crumble, imagine baked apricots, prunes with some muscat and a crumble topping!! TOTALLY DIVINE ! Pre-heat oven to fan grill, place a tray on a lower shelf in the oven. Chop apples into quarters, remove core, chop each piece into thirds. Place into a large saucepan with water, brown sugar, cinnamon and vanilla, cook over a medium heat until soft, 10-15minutes. Prepare crumble mixture, by placing all ingredients into a bowl, rub the butter between your thumb and index finger until the mixture is a uniform consistency. Into 4 individual or 1 large soufflé dish or any other oven proof dish, place the apples, scatter the white chocolate bits and blueberries. Scatter the crumble mixture over the top. 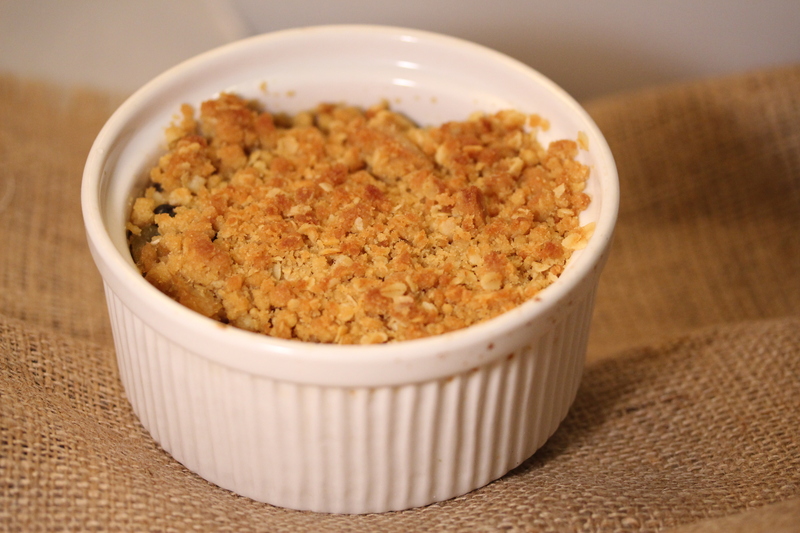 Place crumble onto an oven tray, pop into the oven and allow crumble topping to become nice and golden. 7. Serve with a dollop of ice cream or cream. This mixture can use pie apples, you will need to make sure they are warmed through. This dish is suitable to freeze. Palmiers are bites sized pastries that have a heart shape, light and sweet morsels of sweet goodness, when baking the sugar caramelizes adding a rich flavor to these little pastry bites. These are a great to whip up when hosting and afternoon tea. Cinnamon and white chocolate is a perfect flavor combination. 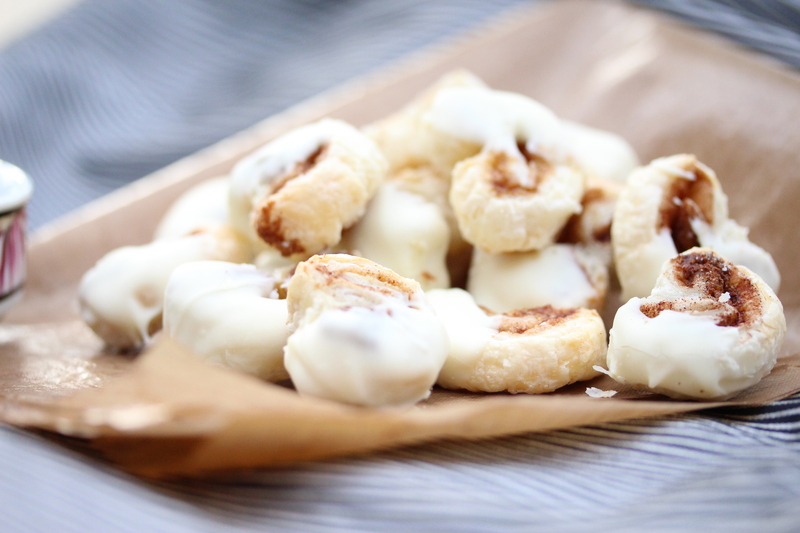 These light and fluffy pastries will set your taste buds into over drive mode. Best of all they can be made ahead and placed in the freezer and baked as required (after step 4). The addition of steam helps us achieve that beautiful ‘puffy’ flaky pastry’, if you do not have a combination steam oven fan bake at 180C for a couple of extra minutes. Preheat combination steam oven to 180C quarter steam or standard convection over to 180C fan bake. Line 2 baking trays with baking paper. 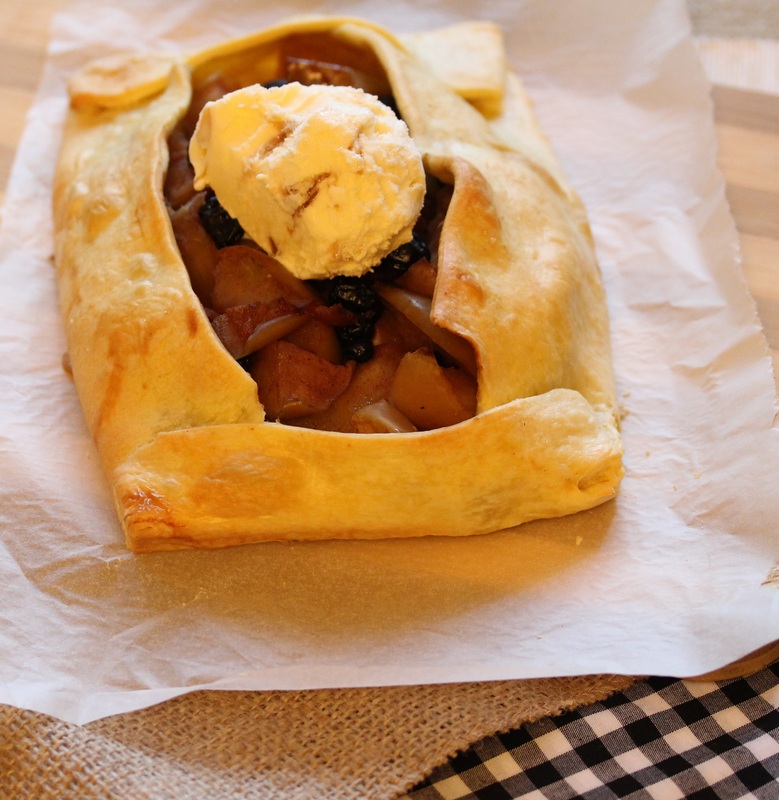 Sprinkle ingredients evenly over 2 sheets of pastry. Fold the left side and right side of the pastry in to the centre and lightly press, fold the left side and the right side of the pastry in half again. Cut into 1cm lengths. Place onto baking trays with a 1cm gap between palmiers. Bake for 12 minutes or until pastry is golden. Line a baking tray with baking paper. 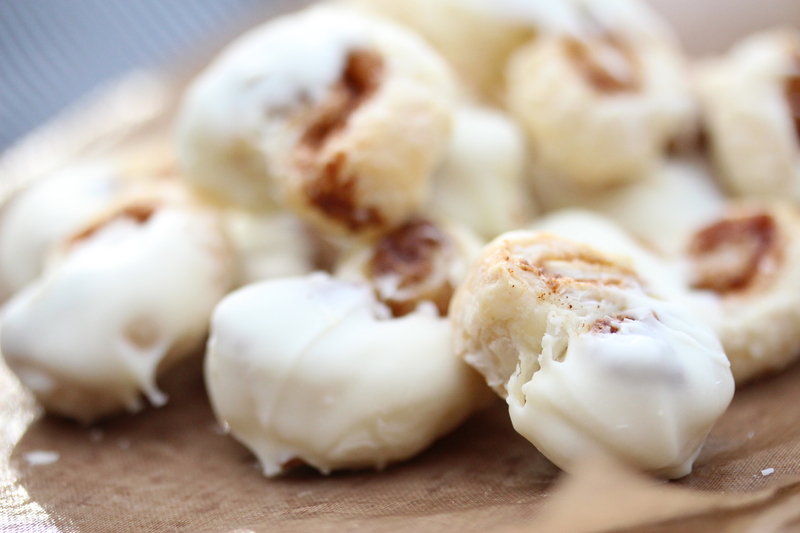 Melt white chocolate, dip half of each palmier into white chocolate, place onto the baking paper and allow to cool. Serve with tea of coffee or as a part of a high tea platter. Cinnamon churros are delicious golden strips of deep fried dough, tossed in cinnamon sugar, what’s not to love !! !You can serve them as is or with a side of Nutella, melted chocolate or caramel sauce. They can be whipped up in no time at all. To squeeze them into a shape you will need a piping bag with a star nozzle, most large chain supermarkets supply these. Always use metal tongs to submerge the churros into hot oil to save any splash back burns. Combine 1/3 cup sugar and cinnamon in a shallow plate. Place a wire rack over a baking tray. Line another baking tray with baking paper. Combine 1 cup water, olive oil and extra sugar in a medium saucepan over medium heat. Bring to the boil. Add flour all at once, stirring until it forms a ball and comes away from sides of pan. Remove from heat. Heat vegetable oil to 180C in a deep fryer or large, deep saucepan over high heat (test with the a small amount of the dough if it bubbles the oil is ready). Transfer dough to a strong fabric piping bag fitted with a 1.5cm star tube. Pipe warm dough on the lined tray into even lengths (this is up to you, long sticks, bites, S’s or U shapes). Carefully transfer about 4 lengths of dough to the hot oil. Cook for 3-5 mins or until churros are golden and cooked through. Use a slotted spoon or tongs to transfer churros to the wire rack to drain for 30 secs, then roll in cinnamon sugar mixture. Repeat with remaining dough and sugar mixture. 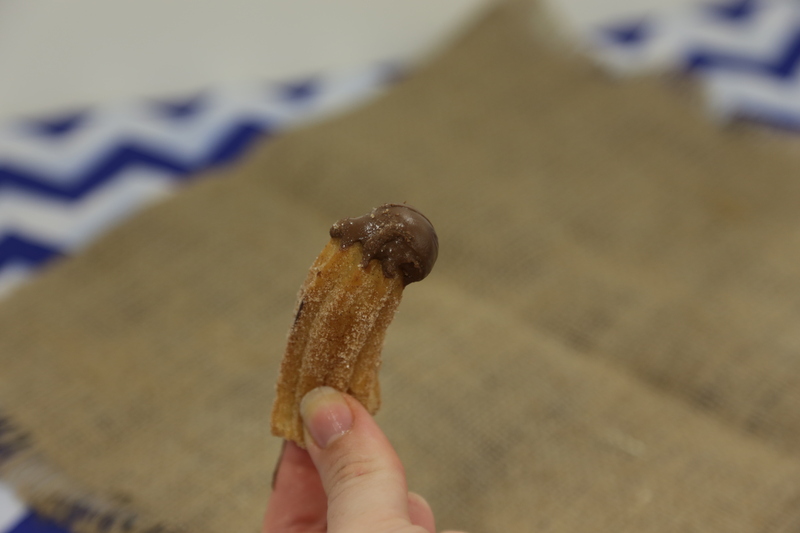 Serve churros tossed in cinnamon or if you are feeling extra wicked try some melted chocolate or Nutella ! These little cups of awesomeness will blow your tastebuds away. 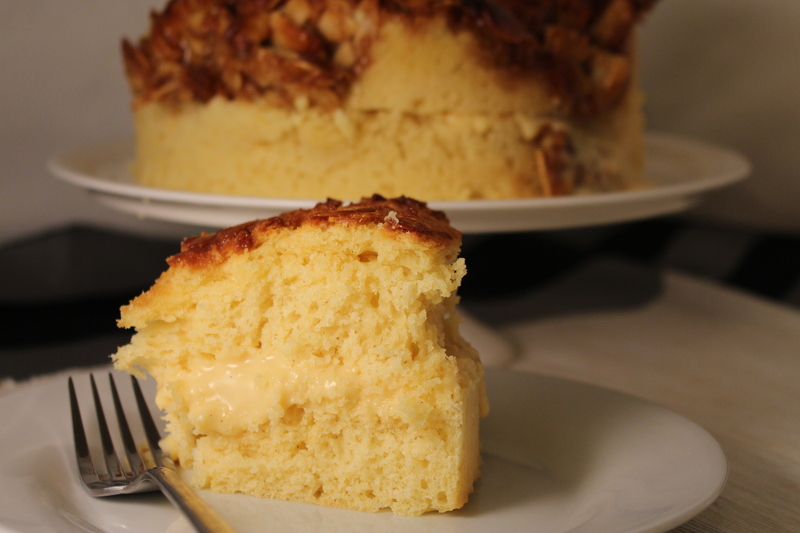 Deliciously light and fluffy. The recipe is versatile, you can top with any flavour you desire. I have chosen passionfruit, you could try chocolate nutella, chocolate, mars bar, oreo, the options are endless. Best of all these cheesecake parfaits look awesome. 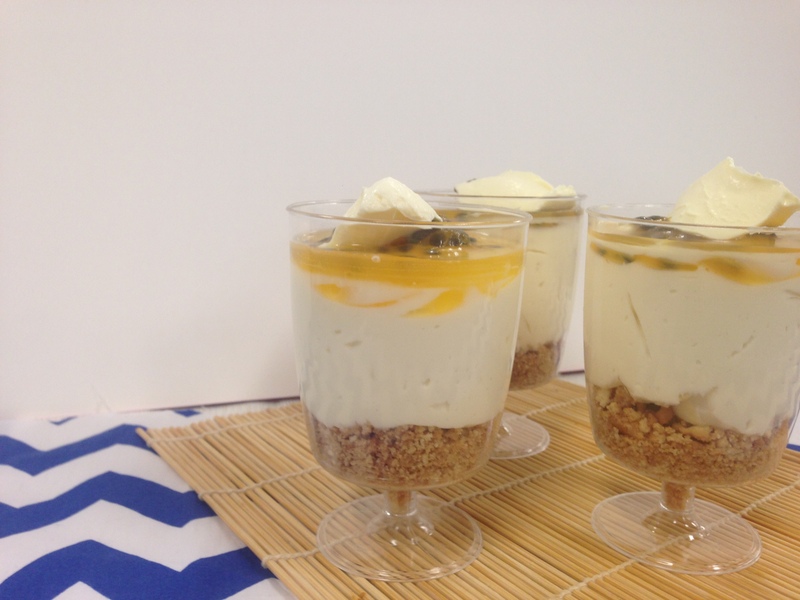 These were made in plastic glasses to take to a BBQ, if you are travelling with these cheesecake cups add the topping and cream just before serving. Combine the biscuit crumbs, butter and cinnamon in small bowl. Divide half the biscuit mixture between four 125-180ml (1/2-3/4C) capacity serving glasses or ramekins and press firmly to cover the base. Place in the fridge to chill. Use an electric beater to beat the cream cheese, sugar, milk and vanilla in bowl until very soft. In a separate bowl, beat the cream in another bowl until soft peaks form. Fold into the cream into the cheese mixture in 2 batches. Spread half the cream cheese mixture gently over the biscuit mixture. Top with the remaining biscuit mixture, then the remaining cream cheese mixture. 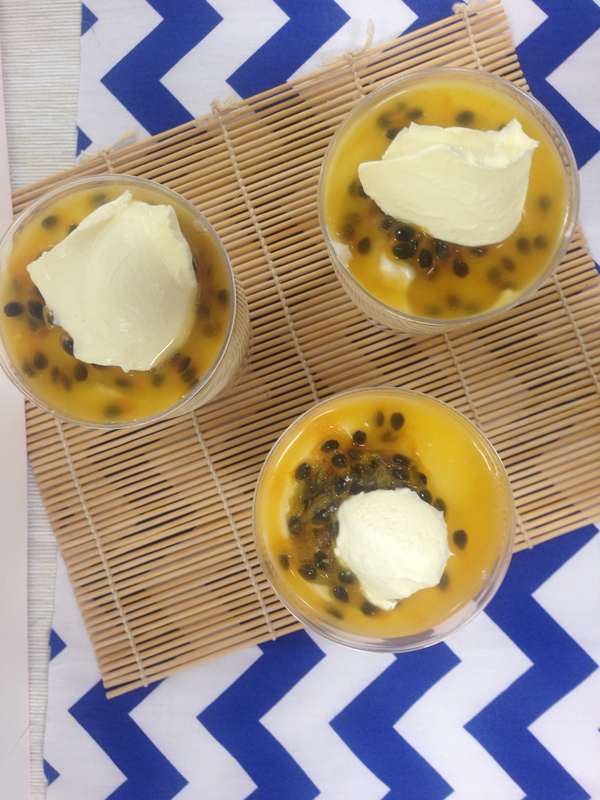 Pour the passionfruit mixture over the cheesecakes. Cover with plastic wrap and place in the fridge until you are ready to consume. Are you looking for a no fail seductive dessert to tempt your loved one this Valentine’s Day? 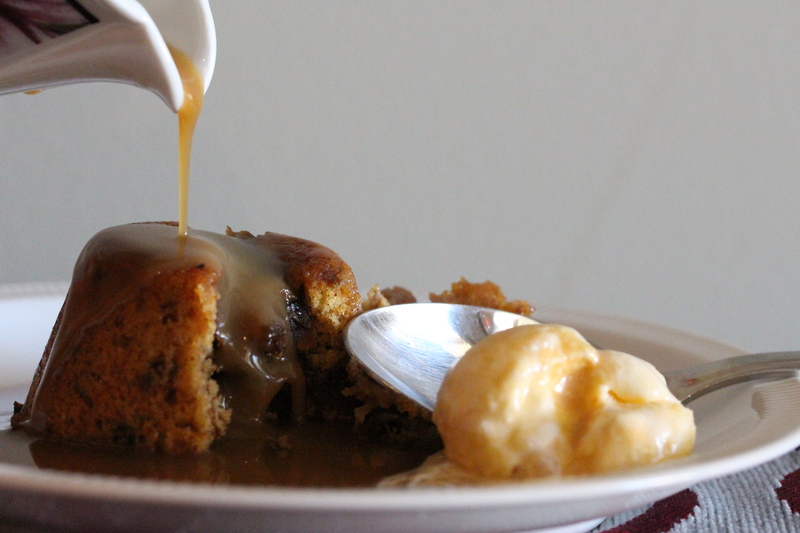 This sticky date pudding is served with lashings of luscious and smooth caramel sauce. 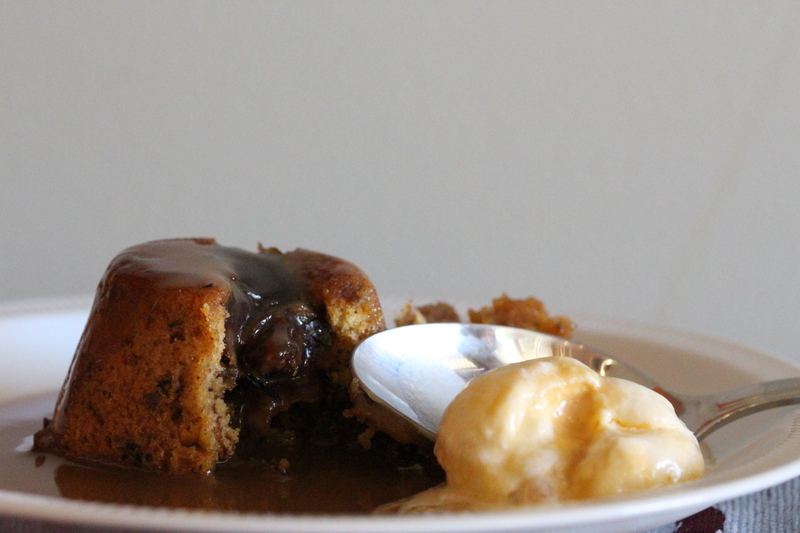 The caramel sauce is so Moorish that you may want to make double and save some to serve with fruit and/or ice cream. 1. Place dates in a medium saucepan, cover with hot water and bring to the boil. Pre heat oven to 180C. 2. In a medium mixing bowl, cream the butter and sugar until light and fluffy. 3. Add eggs and vanilla, mix until well combined, add flour. 4. Remove dates from heat, take out 6 softened dates and place aside, add bicarbonate of soda and mix well. 5. Chop the 6 dates in half and place in the bottom of a silicone muffin pan, greased dariole mould or muffin tin. 6. Mix the date and bicarbonate mix through the cake mix. Top muffin tray/moulds. Place into over and bake for 15minutes until firm to touch and golden. 7. Whilst the muffins are in the oven, place all of the sauce ingredients into a small saucepan, bring to a simmer, maintain a simmer for 10minutes, the mixture should reduce slightly. To serve: Invert each muffin, serve with lashings of hot caramel sauce and a side of cream or ice cream. These sticky date muffins and caramel sauce can be made ahead and reheated, a quick zap in the microwave for 30 seconds to warm through, the caramel sauce may take a minute or so. Make 12 individual muffins, this mixture can easily be halved to make 6 or baked in a larger tin to make a cake / loaf. Try following me on Facebook or Instagram for regular foodie updates ! Remember to pin your favorite recipes to your Pinterest account! 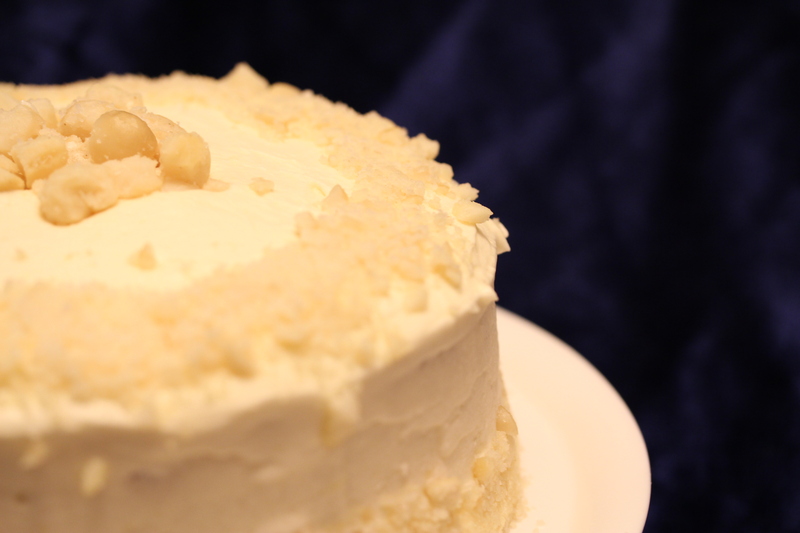 Traditionally carrot cakes are made with walnuts. This recipe uses finely ground macadamia nuts, I find macadamia nuts have a sweeter more delicate texture than walnuts do. 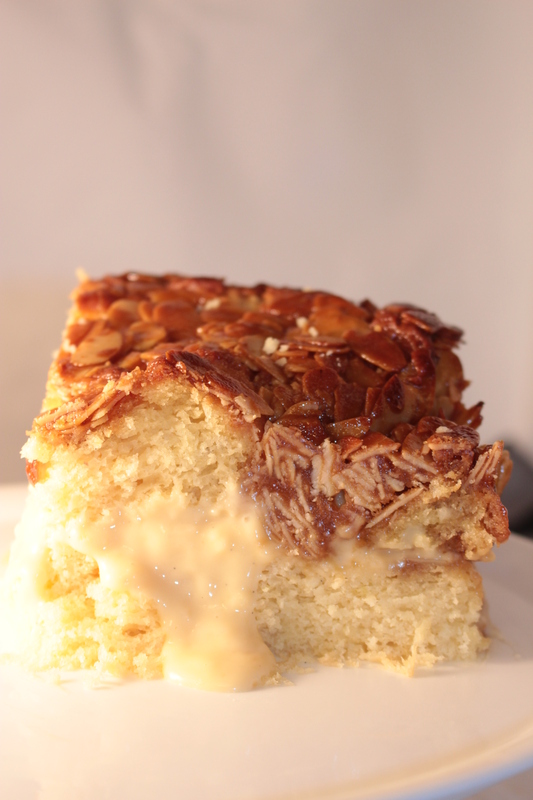 The delicious sweet and nutty smell of this cake will waft through your kitchen, you may even find yourself staring at your oven door in anticipation of the cake being ready. A trick I have learnt is to soak a thick tea towel in water and to tie it around the cake tin, be sure to make sure the end tuck in so no small pieces are sticking out. Why would I do that? I do that because it allows for an even penetration of heat, stopping the dreaded dome. I will try to photograph how it looks through the oven door during my next cake bake. Pre heat oven to 180c. Line a medium spring for tin with baking paper and spray with oil. Separate eggs, place yolks aside in a small cup. Beat egg whites until stiff peaks form. In a separate bowl cream butter, sugar and vanilla until light and fluffy, add egg yolks lightly beat until combined. Add flour, cinnamon, baking powder, baking soda, carrot, currants and macadamia nuts, mix until well combined. 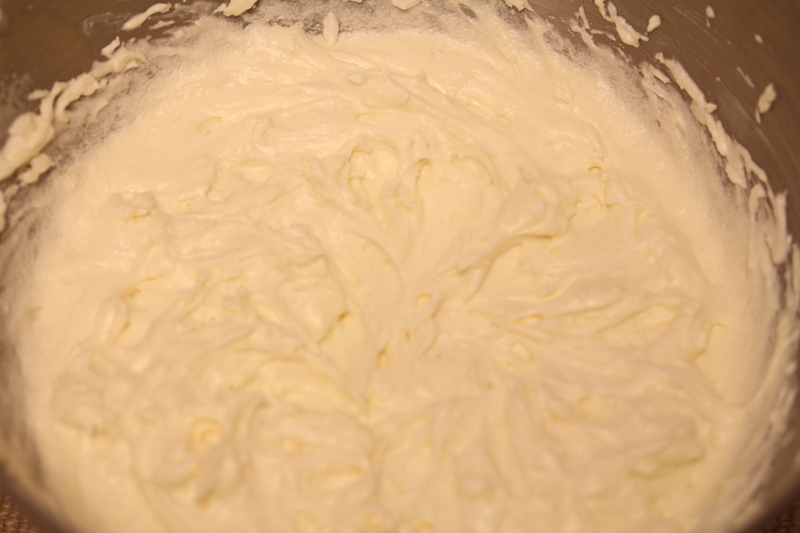 Gently fold eggwhites into the cake mixture, do not over mix or the air you worked hard to incorporate will deflate. Pour mixture into cake tin. Bake for 35-40min or until skewer comes out clean. Prepare the frosting mixture whilst the cake is baking, to make the carrot cake variation, after step 1, add the cream cheese and lemon zest, beat until combined then add remaining ingredients. 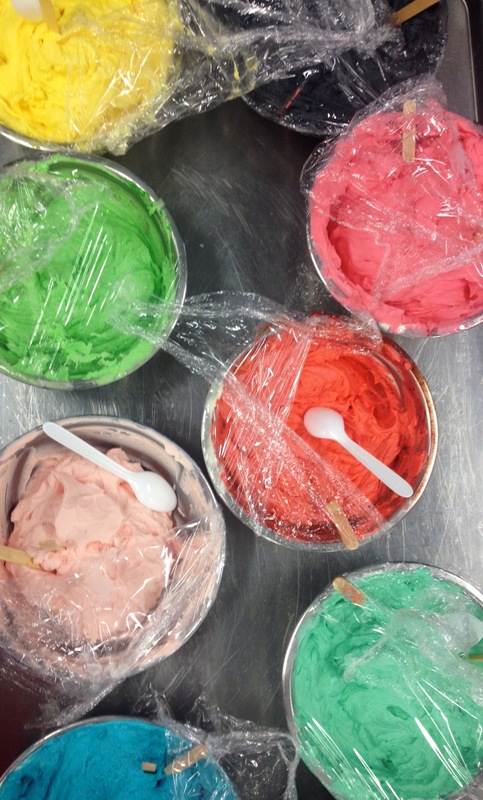 Set frosting aside until required. I find frosting easier to work with at room temperature. Cover cake with a generous layer of icing. 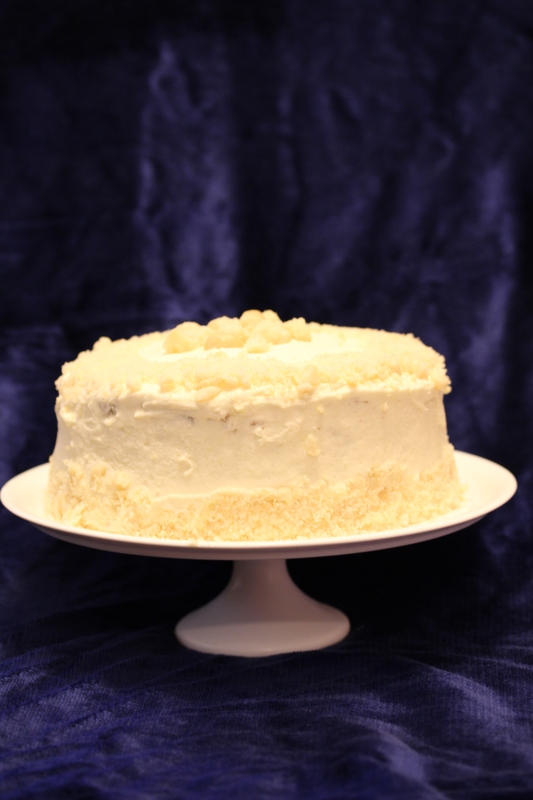 If need be one layer of icing can be placed onto the cake, then pop the cake into the fridge for 15minutes to harden the frosting and apply another layer. 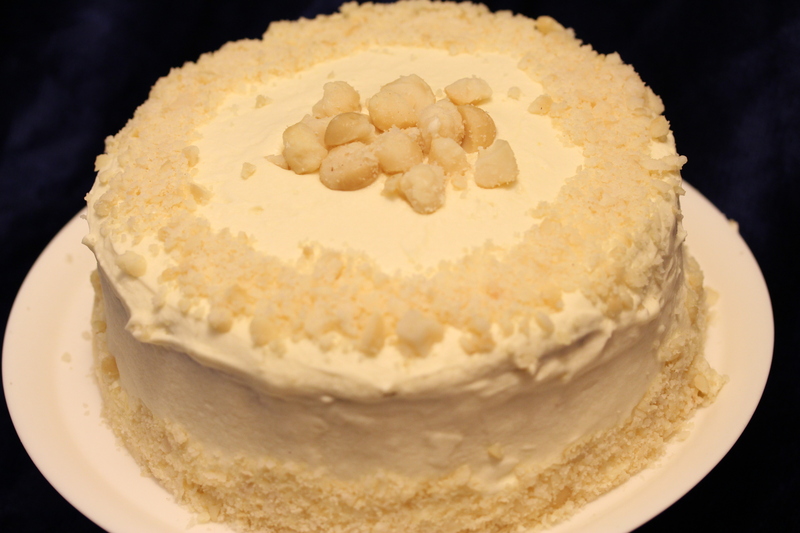 Using the back of a spoon, gently press coarsely chopped macadamias around the base of the cake and around the top edge of the cake, place remaining nuts into a peak in the middle. Making a delicious cake requires just a pinch of patience. Creaming butter and sugar ensures that the sugar is distributed evenly in the butter it also allows air to be dispersed in the butter creating a light and even to rise cake, creaming is likely to take between 5-8minutes. Adding lightly beaten egg eggs to the butter and sugar mixture and whipping for a minute on a low speed helps to incorporate air, creating a light and fluffy mixture. 125grams butter, at room temperature. 1. Heat a fan forced oven to 160C. Line a small cake tin with baking paper. Beat butter and sugar until the mixture turns an off white colour. Add the eggs, ½ the lemon rind and vanilla beat until well combined. Mix the coconut and flour in a small bowl, using a spatula fold the dry mixture alternatively with the milk. Spoon the mixture into the lined pan, use the spatula to smooth over the surface. Bake for 55-60minutes, the cake should be golden and a skewer should come out clean. Dust with icing sugar and sprinkle with yellow popping candy or any other sort of small/crushed candy. I find using Buttermilk keeps my muffins more moist and gives them a little extra tang. The buttermilk is a perfect, slightly acidic, addition to a citrus sweet. Heat combination steam oven to 200oC quarter steam and heat/ 25% humidity. Spray a muffin tin with cooking spray, I used silicone bakeware. Measure the buttermilk, and stand aside (this will prevent the butter hardening up later). Cream together, butter, sugar, vanilla and orange zest, add egg and orange juice and stir to combine, alternatively add flour and Buttermilk, mixture should appear slightly lumpy. Divide mixture evenly into 12 hole muffin tin and bake for 15minutes or until evenly browned. Whilst cooking prepare ganache, by heating cream and pouring over chocolate until chocolate has melted. If chocolate does not melt completely, oven a gentle heat or double boiler heat until melted. 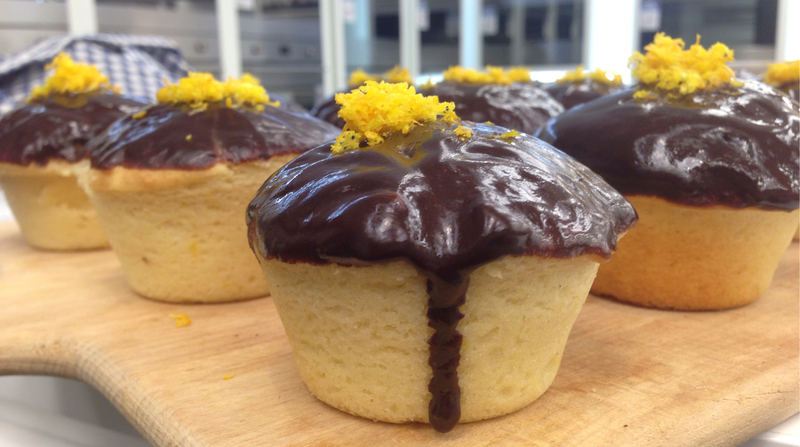 Once cupcakes are cool to touch, individually dip into ganache and sprinkle with orange zest. Left over ganache keep well in the refrigerator, can be re-heated and tastes amazing on ice-cream ! 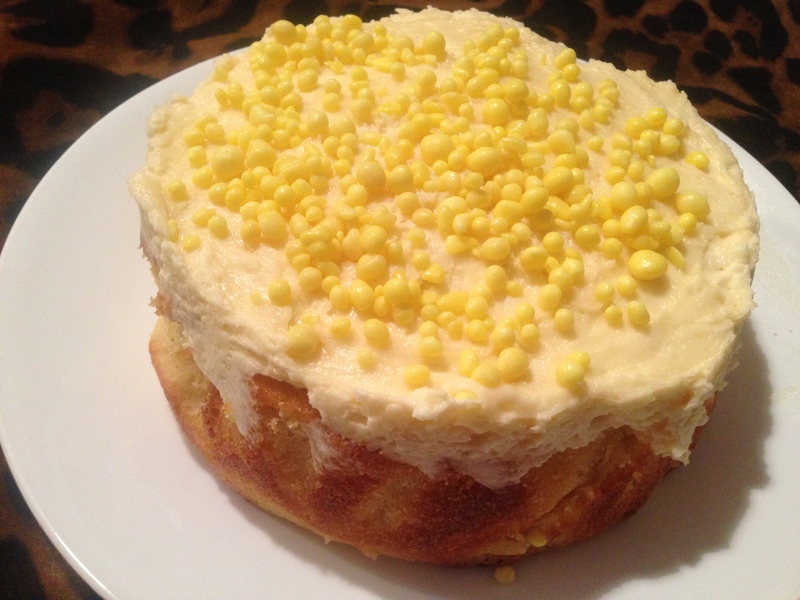 The BeeSting Cake ! The most delicious cake I have ever made ! After sitting around with some of my colleagues discussing our favourite cakes, I decided I wanted to create my own version of the BeeSting cake. This is possibly the most multi-faceted recipe I have tried to blog, this one you may need to print out and follow as it has several components. Each component takes a little bit of time to create, however, each component is rather simple, so do not be afraid to try this recipe. 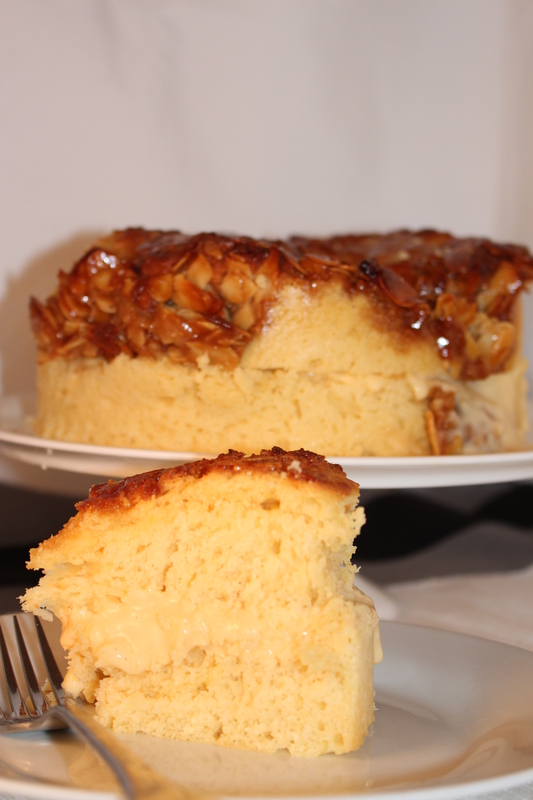 The yeast gives this cake a wonderful and light texture and will fill your house with the most mouthwatering aroma. I hope you enjoy this recipe make sure you share it with your families and your guests, allowing them the privileged to try and to savor each morsel of the BeeSting. Heat milk in the microwave for 30 seconds until warm; add the yeast and caster sugar, set aside until it is slightly foamy, approx. 5-10 minutes. In a large bowl mix all of the remaining ingredients until well combined, 2-3 minutes, I did this with my stand mixer with the paddle attachment. Cover with plastic wrap and allow to double in size, this may take an hour, using a spoon pierce the surface and allow the mixture to rise again whilst you prepare the tin and topping. Grease a 9inch deep cake tin with butter. Pre heat oven to 180C fan forced. Place the butter, sugars, thickened cream and honey into a medium sauce pan, allow to melt over a medium heat, allow the mixture to simmer for 5 minutes it should turn a pale brown, stir through the almonds, remove from the heat. Pour the cake mixture into the greased tin. 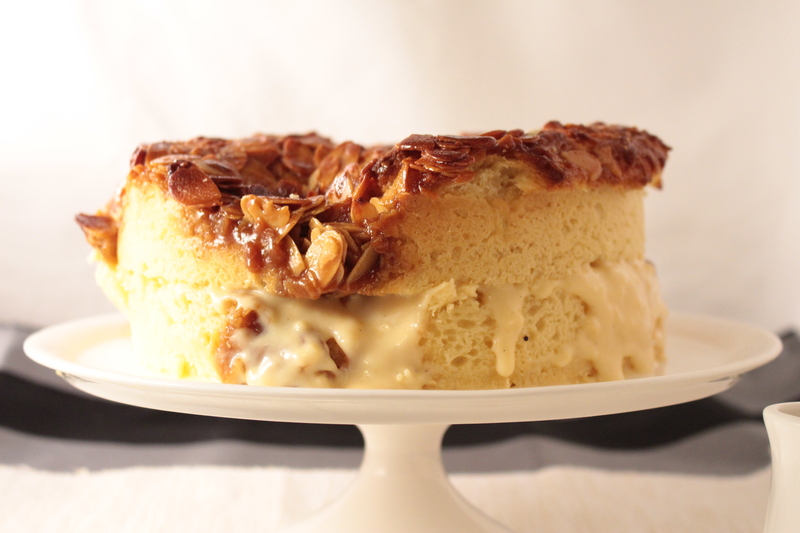 Dollop teaspoons of the almond crunch topping across the top of the cake. Cook for 23-28minutes, until a skewer comes out with no cake mixture on it, it may have some caramel on it. Remove from oven, allow to cool in tin for 10-15minutes or until almond crunch topping has hardened. Once hardened transfer to a wire rack to cool completely. *wrapping a wet tea towel around the cake tin prevents the centre of the cake rising and will help you to achieve the nice flat top. *** if you want to serve the pieces to without the custard oozing out, cut the top into wedges and rearrange on top, prevents the oozing.